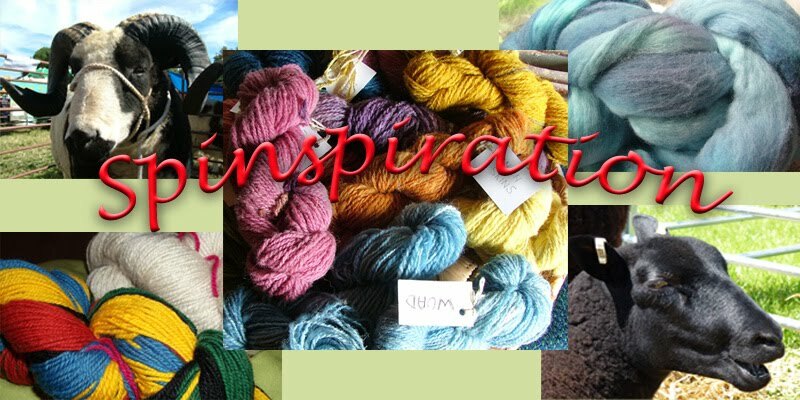 Spinspiration: Dawn - a busy month at the wheels! Dawn - a busy month at the wheels! 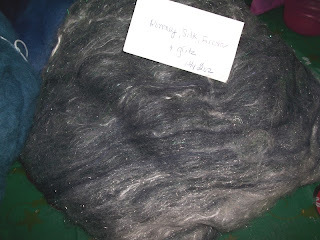 I've had the spinning bug so far in 2013 and longing for that to continue, lots of fibre and fleece to work through. 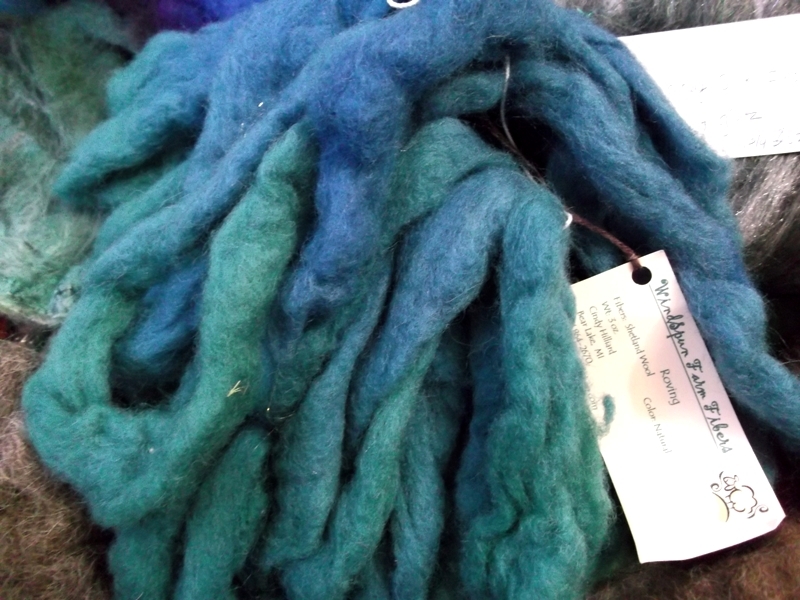 Of course that means there is lots of handspun wool building up too, so there are projects in mind or in progress too. 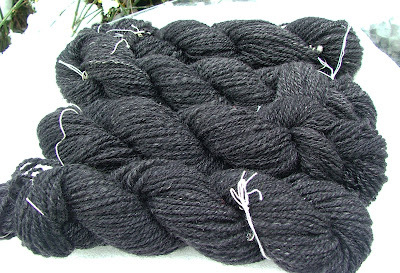 So since finishing the Autumn Garden View shawlette my next spinning was to finish off some black Hebridean fleece with a little bamboo lightly blended through it, that I started in December. It's a bit darker than the photos show, but hard to get that on the camera in recent daylight. 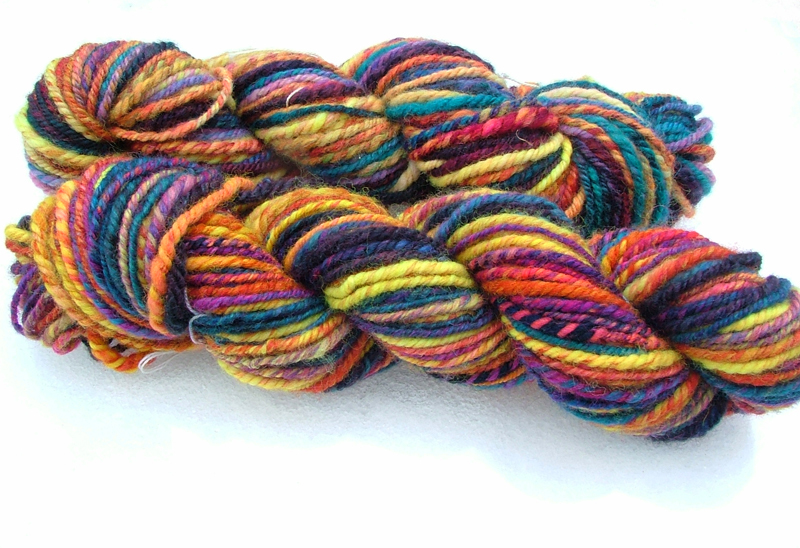 This has spun up lovely as a DK/Worsted yarn that I think will make lovely socks, and there is 369m of it that will go a long way. These are the skeins. I love these, and have plans for a shawlette/scarf with this. There is 224m in total of these skeins. With Christmas decorations being packed away, my Louet wheel made a re-appearance and so I could have both wheels working on different projects again. 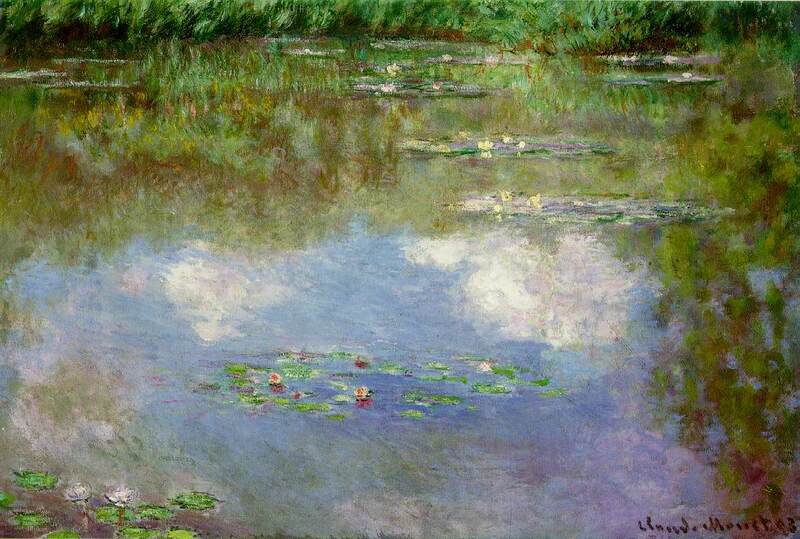 I hadn't used the Louet for a while so we got reacquainted and it was lovely. I spun another batch of Hebridean fleece on her, this being slightly lighter than the other one above and a lovely amount of yarn 347m. So good to see those huge bobbins full again! 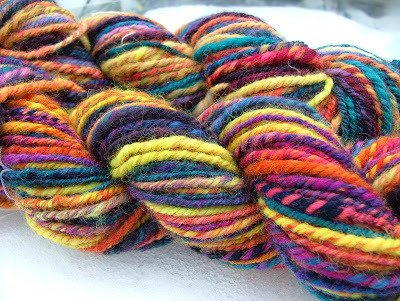 Once the Wee Peggy was free I finally got around to plying some rainbow merino singles that had sat on bobbins for a long time ... I hadn't realised how long until I looked back at some pictures and realised it was 18 months (oops!). The problem was I didn't know what I wanted to do with it. 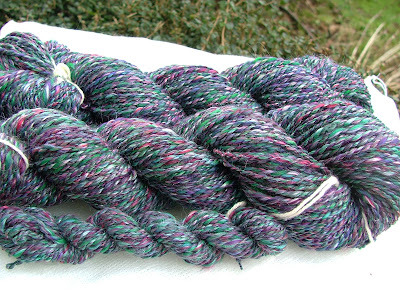 So I decided to n-ply it into a nice bulky yarn, it went curly as anything as the singles were so stale but after a wash it was perfectly balanced. 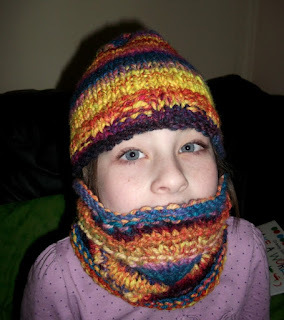 My daughter Imogen saw the yarn and put in a request for something for her, and asked for a close fitting cowl. 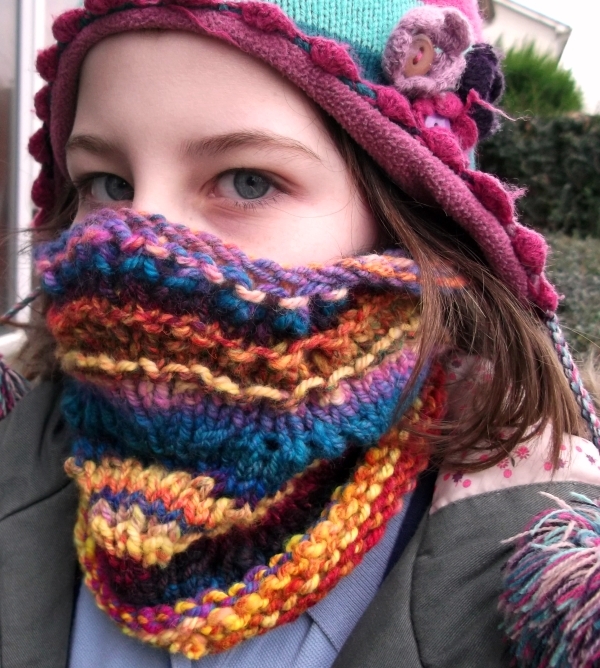 So a cowl was knitted. There was still just less than half the yarn left so she asked for a hat. I wasn't sure there was enough for a hat but hey presto there was. 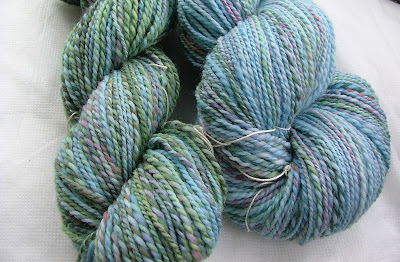 I enjoyed knitting it so much I knit it twice! 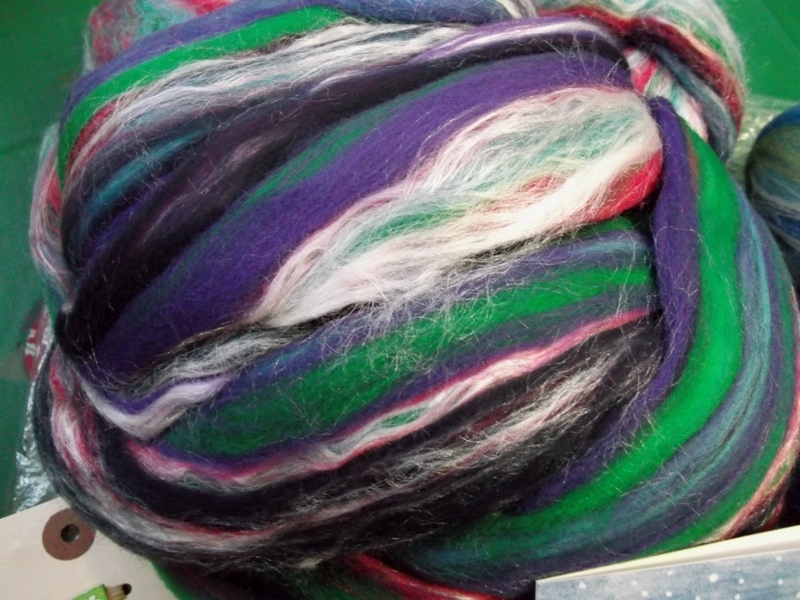 Yep, it was too small so I frogged it and restarted only a little bigger. Phew, that's quite a bit to share already but hey I'm not finished yet. Ready for some more? Good because I have some lovely pictures to show you! 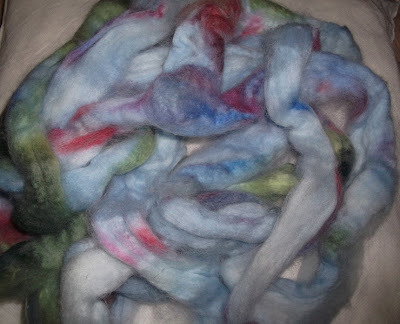 This was some more off my swap fibre, some Merino/Silk blend from Winghams. 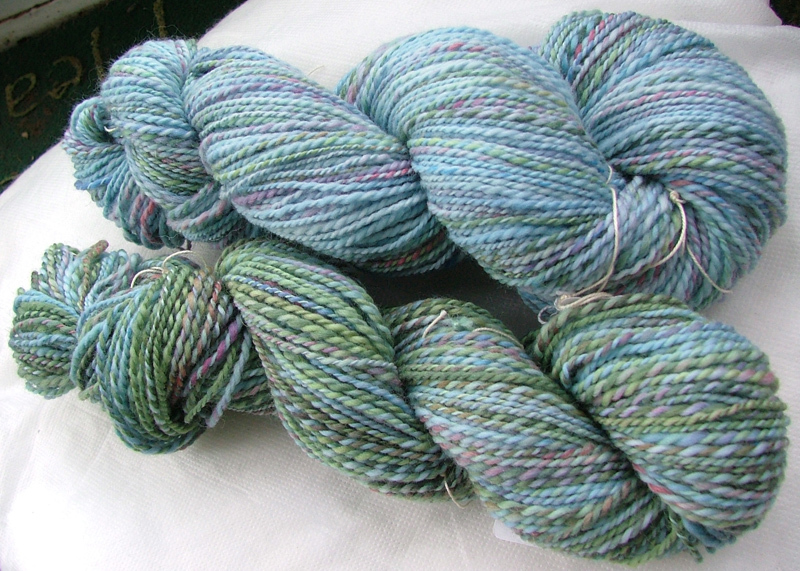 I split this in two and spun the singles and plied together. And finally on the spinning was this lovely fibre from my stash - some Colinette fibre which is lovely and soft and drafts beautifully. 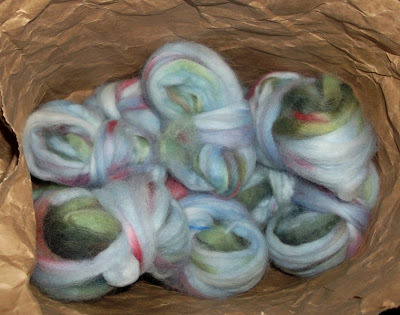 I've heard and read some bad stories of their fibre (felted, etc), some recently on a ravelry post, but the fibres I have had from them have all been lovely. 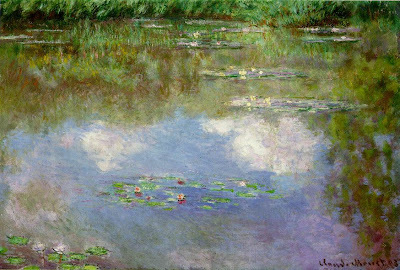 This one was inspired by Monet's Waterlilies which I think you can see from these pictures. 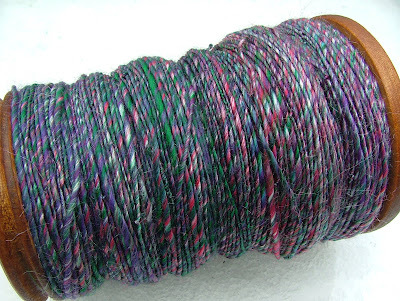 I separated this into pencil thickness lengths to spin and also separated the darker parts from the lighter ones so that some of the yarn comes out in darker shades. I have ideas of this being knitted and felted into a bag so this will work well with that - more on that another day. Here is the yarn which I am so pleased with. I told you I had the spinning bug this month. 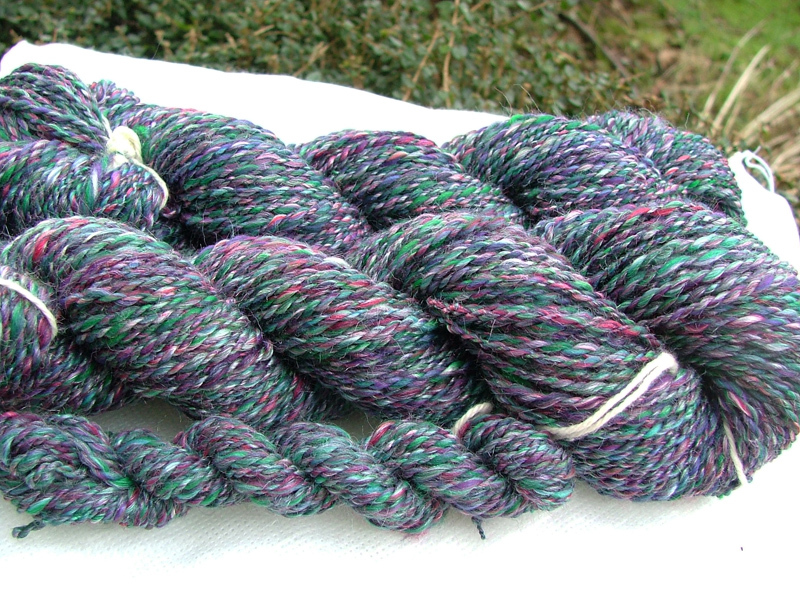 As I sit here typing this both wheels are empty, waiting for the next fibre. 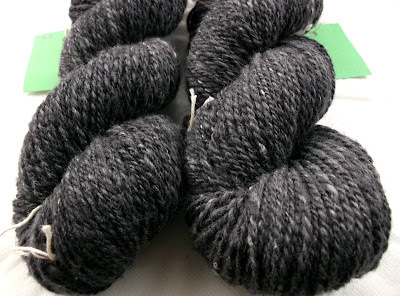 Now I have cast on a couple of new knitting projects, nothing to really show yet, but one is the shawlette/scarf in the sparkly Shetland blend yarn above. 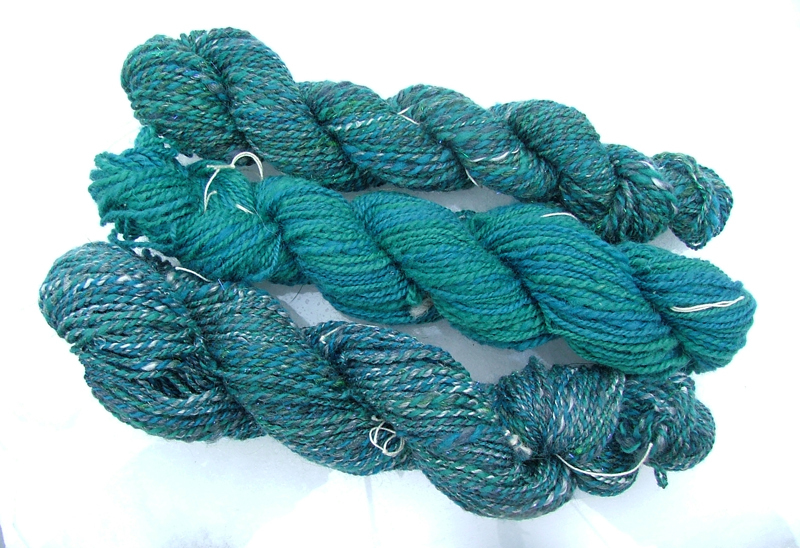 The other project is a tunic top for my daughter using some blue yarn I spun last year, some she helped me dye. I think that is most of it, there are some other knitting projects going on too, using up odd balls of this and that yarn - mostly becoming new cushion covers so these will take a while and a lot of yarn, and some other fun projects I'll show you sometime over the next few months. I'm not sure if I can keep up with this kind of productivity but we shall see, and I am having so much fun with it at the moment and have plenty to keep me busy.